It's always good to welcome a new business so today I'd like to introduce a Dorset-based company called PerUomo - here's a link to the website - which gets brownie points immediately from me for using a model who looks as though he may actually have seen his 30th birthday, men's magazines please take note. Cutting to the chase it has some good stuff on display. As regular readers will know I've been looking at refreshing my tie collection a bit as I've been doing a small amount of telly. 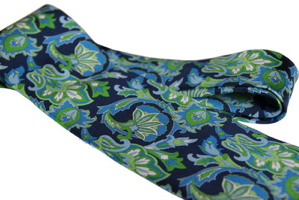 One of my pet hates is boring Paisley designs; you get a lot which are self-consciously loud but end up a bit samey. The pattern on PerUomo's Italian pure silk green and blue is regular enough not to be utterly garish but spaced out enough to be a bit interesting, which is my idea of a good design. Others may disagree of course but at £34.95 it's certainly on my list of possibles. There's a good range of colours for people who don'y fancy this one. I can't speak for how well-made they are because I haven't actually seen one in the flesh, but I have no reason to doubt them. To accompany this I might consider a pair of cufflinks from the company, although if I were matching them I'd have to see them in person to decide. There are a lot of designs similar to many I've seen before but I'm quite taken with this blue and white gilt pair. You know the routine, a shade too big and they might swamp an otherwise quite tasteful outfit. They also sell braces which are not my thing, but they have a good selection for wearers. 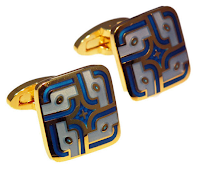 The family members who run this site already have one placeholder for a forthcoming range of cufflinks in addition to those already on the site. I'll be watching what comes in with interest.